I'm very excited to share with you that in less than two weeks, on Wednesday May 13th, 2015, I'll be giving a webinar through the Private Practice Section of the American Physical Therapy Association. "Advanced Branding Concepts for Physical Therapy"
There are going to be some very exciting topics starting with some foundational marketing and branding principles, extending to management levers, and perhaps most excitingly, I'll be sharing with you several marketing metrics to measure the financial returns on your branding initiatives. Oh, and there's that added bonus of our time together counting as CEUs. There has been a LOT of clamoring in social media about licensed healthcare providers and their licensed and/or unlicensed care extenders; believe you me, it's not just the physical therapy world that has been talking about this. Care extension has been at the center of a rather heated, uncomfortable, and disuniting talk for MANY healthcare circles including that of physicians, PAs, NPs, RNs, LVNs, CNAs, rad techs, diet techs, nutritionists..... need I go on? PT v PTA v extenders v techs v aides v other professionals.... just might be #MissingTheBigPicture in #healthcare. Formulating poss blog. So, after reviewing the true spirit of the discussions, debates, yellings, and social media japs as of late, I've come across this post (which has been in sitting in my blog queue for some time) and realized.... THIS is the center of our problem. PS. Yeah... this may be a tiny bit of a rant; but I do offer real solutions with plenty of background. PPS. I've split this post up into Parts 1 & 2. Part 1 as the situation analysis & Part 2 as the solution. Enjoy! In once sentence, here is our problem: "We're still trying to make a better horse and buggy when we should actually be working on a horseless carriage." A reference to the oft quoted to Henry Ford, though perhaps not so accurately attributed in this case. I feel as an industry, and certainly an economic construct, healthcare as we know it has topped out. It has been spinning its wheels in its own Success Dilemma; the vicious repetition of what worked in the past in hopes it continues to work for the future. This particular dilemma is not unique to any one industry. It happened to the horse and buggy when replaced with the horseless carriage. It happened to radios when they went from tube to transistors. It happened to Blockbuster when it got paved over by digital streaming, NetFlix, and the like. It happened and will continue to happen when sticking to whatever once made success, ultimately creates the rigidity that causes its failure. As for healthcare, let's all be honest for just one moment. EVERYONE is talking about care extenders. And, why? It isn't for the greater good. It isn't for better efficiency or even the brainstorming of "innovative" care models. Because, again, we're being honest right now, right? This talk has been around since commerce has been around: "If someone can do something for cheaper..."
I'll come right out & say it even if no one else will: IT'S ABOUT THE MONEY! Extenders are cheaper by the hour than for whomever's care they extend; therefore, by being less costly upon a business based on human labor and time, it makes the margins better to substitute as such. Yet, We've TRIED this already. What has happened? Healthcare is STILL way too expensive and beyond sustainable for any local, regional, or national economy. And, it is unsustainable for all areas of practice. The problem is SYSTEMIC. And guess what? Our consumers are absolutely sick (ha ha) of our internal bickerings -- they want applicable solutions TO THEM, not you clinic, business, firm, or organization. Yet still, what have we all been yammering about? Finding new ways, crafting new laws, enabling new policies, and trying to sway professional opinions amongst our colleagues in such a way that doing things "differently" in the name of cost savings or what have you is then a good thing. Now, there are times when it is certainly necessary. When the automatic blood pressure cuff came out, did you really need a physician or nurse to do duplicate this manually as a health screening? NO! This and many more types of care elements in this vein exists throughout the continuum of healthcare. However, this isn't where our problem is. This, again, is a Success Dilemma. We're trying to do the same thing over and over again (definition of insanity); because it has once worked, it has been working, and we can only expect it to work again. The problem is, everyone is doing it. Everywhere, in health systems, healthcare companies, private practice, for profit multi-center firms... everyone is focusing on better margins. As margins have been falling with lower earnings (due to various factors, including declining reimbursement rates), dismal growth is being reported; that's a bad thing when considering the shareholders. Since firms don't want investors to start dumping their shares, the knee jerk reaction for any company when costs are squashing margins comes to play. Reimbursements went down, so what did we do? We billed more and paid our people less. When that didn't work, we downsized. When that didn't work, we started using cheaper labor that could hopefully substitute for quantity and quality. We hoped all of our management decision wouldn't affect quality, or, that no one would notice. We hoped that as our little management tricks served to inflate our earnings, improve margins, and hopefully restore growth, that quality care would not suffer. But, it didn't work and it doesn't work. Quality ALWAYS suffers. And, this is where we fail... this is where the Success Dilemma destroys us. So, what's the answer? Well, it's nothing organic nor is it new. Nope. It's absolutely intentional. When success fails, disruption occurs. Industry disruptions have historically happened when characteristics of products (or services) offer inherently novel combinations of traits which allow people to go about their day in a way never done before. I need to stress here that it isn't about performance features; making something fast faster isn't disruptive per se -- this just makes all the other competitor shift their understanding of the status quo (ie. "Henry Ford's" faster horse + faster buggy vs. horseless carriage). Disruptive innovation creates entirely new markets because of the RESULTS of their products; entirely new ways of thinking; entirely new lifestyles; and entirely new sets of human behaviors. If what you're trying to do is same thing but faster and/or more efficiently, it isn't anything innovative at all. It certainly isn't "different." If you go down this road long enough, you'll find the same "solution" humanity has always found when things can't go any faster.... you take SHORTCUTS. So, what's my recommendation, you ask? 1. First, I suggest we take a look at what healthcare was and has become. During its inception, healthcare was really the practice of healing arts when it came to the human experience. Be it physician or surgeon (yes, they were considered different in a time before), sage, shaman, healer, priest, witch, whatever... the human experience looked to experts for their knowledge as well as their information and understanding of the human body. As science began to take hold for the human experience, societies started to notice certain reliabilities and consistencies and gravitated to what was termed as the practice of "medicine." Nevertheless, the skill sets involved all circulated around one thing: Information. As various perspectives on the human experience and health evolved, healthcare eventually became a business model with many disciplines to create a care team, typically headed up by a chief physician and governed by an administrator. As costs started to present themselves insurmountable, we tried different things. A gatekeeper model, a maintenance model, preferred provider, wellness... you name it. The problem is, the whole time we were still rationing and distributing knowledge in the form of access to care, prescription of pharmaceuticals, and scheduling of procedures. We failed addressed the one thing that could help us. Since information is practically free now, it is no longer valuable as it stands alone. And, while certainly, the information isn't always accurate as framed on any given website due to generalization or what not, consumers don't care. They already have their information, what they are now seeking is value. As such, my first recommendation is that we get honest with ourselves, our consumers, and all of our stakeholders. Healthcare has spun out of control in so far that it is no longer a viable business model in and of itself. And trust me, that is HARD for me to say. I spent a lot of time, blood, sweat, tears, and money getting my degrees and training to be licensed to do what I do. I pay good money to maintain my license to have the privilege to provide care for others. Still, it isn't enough. Honesty declares that the monster we've helped create by ALL the current practices we have participated in... has failed. 2. Arriving here, my second recommendation becomes a little more obvious. Healthcare is a social burden. As such, solutions must be forged together. All this talk about extenders, cost savings, and blah blah blah... it only divides us. It never unites us. Unity is what we need. Unity within the professions; unity amongst the professions. This is part of the big picture I've been talking about. The solution I recommend has to do with social responsibility as form of economic sustainability and competitive strategy. I base this off of what I'm observing in the grumblings, debates, and opinions in the healthcare marketplace at large. I also base this on the many business studies that have proven a properly leveraged corporate social responsibility (CSR) as that which adds significant value, and sustainable value at that, for consumers. As such, I think it is fair to say: Healthcare is facing a crisis in social responsibility. The iron law of responsibility says that in the long run, those who do not use power in ways that society considers responsible will tend to lose it. So I ask you, are our healthcare systems using its power responsibly? I would offer the answer is "No." If we were, we wouldn't be in this pickle. We wouldn't be arguing amongst ourselves while all of our consumers, shareholders, and stakeholders are at our throats in one form or another. So again, my second recommendation is UNITY. We can't do this if we're divided. We can't solve this if we're bickering over the most minute of things which do NOT cause to help the big picture. This means that each profession needs to humble themselves and stop thinking about their supply side perspectives. Sure, physicians do more than prescribe. Sure, pharmacists do more than dispense. 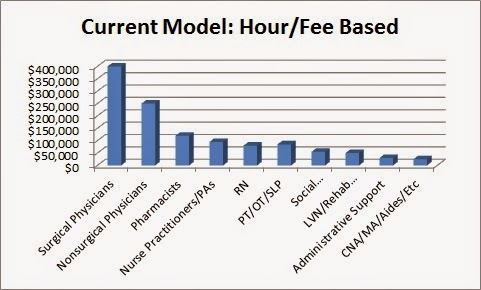 Sure, nurses do more than attend. Sure, rehab therapists do more than massage or exercise. Sure, technicians of all sorts do more than press buttons, wave wands, or take blood. Yes. Yes. Sure. Sure. All of it is correct. But, the fact of the matter is this, all this bickering is going to take the power away from both provider and consumer... and place it completely into a third arbitrary party. At that point, no one gets a say. Don't think so? Just ask those struggling with new contracts; it is so. And, it is terrifying. 3(a). As such, this is my third recommendation: pursue Value Based Healthcare. What?! This isn't anything new, you say? Well... it isn't. People have talked about it. But, people have never AGREED on it. There are 101 definitions to what value based healthcare is and should look like. This is what I'd like to suggest: Let's examine value from the perspective of the healthcare consumer. A quote (likely a paraphrase) from one of my business professors goes something like this: "What companies need to do is to develop products by understanding circumstances in which they are used by customers... " It is here that I believe value can be found for how we can provide healthcare. We, all of us, as internal stakeholders and a community of healthcare professionals need to look at our consumers and external stakeholders and ask ourselves what their circumstances are to which the need arises that they demand (want/need) healthcare services. For it is in those circumstances we find the first seeds of value. As such, let's work from the bottom up. Healthcare consumers want two things: (1) to stay as healthy as possible for as long as possible, and, (2) when health concerns inevitably arise, to have immediate access to expertise and care. With this in mind, I ask the rhetorical: Is a 4 minute office visit by a physician educating you that you have a flu and don't need antibiotics valuable to its cost? Or, is it better that a message be sent by a patient, screened by a provider, and response given through a digital patient portal? Is making that same 4 minute office visit to discuss your back pain really all that valuable? Especially when the result is "do these nonspecific print out stretches," take "these pills," and "come see me in 4-6 weeks if you don't feel better" truly valuable? Even worse, when after those 6 weeks, you get referred to a physical therapist only to wait for another week or two to get scheduled? Or, would it have been better to register a digital health concern of a musculoskeletal nature and get immediately referred to your physical therapist? The answer is obvious: It isn't. It isn't responsible. It isn't ethical. It isn't right. The situation is clearing wrong. It is no where near functional, efficient, good for providers, good for consumers, nor right for society. Value Based Healthcare sounds like a great idea; but, does it have any backing? Does the framework even have theoretical grounds for building? What about the "evidence?" When finding a mentor, make sure they have a good personality. After all, you'll be interacting with this person for quite some time in the coming future. They need to be personable, compatible, and respectable in your eye. They'll likely have many encouraging things to say to you, and, if they're a good one, they'll have some chastising and constructive criticism as well. Speaking of which, one of the most important things a mentor can do for you is to prune and sharpen your dreams. Much like a diamond cutter makes the rough that much more valuable with each strike, your mentor must carefully and purposely prune you into the gem from behind the rough. This can include reining you back in when your head is way beyond the clouds -- like, in outer space. They also know how to smack you out of your depressio-doldrums as well. In essence, they keep your outlook balanced and keep you honest with yourself. A good mentor needs to be quickly accessible and very attentive to the many things you won't be saying. They can read between the lines, through your poker face, and into your heart-of-heart-of-intentions... even the ones YOU don't even know you have. They are quick to respond to your questions and can do so with compassion as well as understanding. After all, they were once where you were. Sometimes, mentees forget to check in with their mentors. A good mentor will remember you; recall that its been a couple months of radio silence. For whatever reason, I've found that this is commonly the time when mentees need their mentors most. As such, if you see a prospective mentor who has a habit of checking in on people, remembering them even after months if not years past, you've found a good one. 5. Willing give you the ugly, ugly truth. When it's all said and done, you're moving onto the next phase of life, your mentor needs to be willing to give you the ugly, ugly truth. Stage by stage in our lives, we tend to see things with a certain lense of naivety. However, with this innocence exists the wonderful thing of hope. However, hope must be tempered with reality as carbon is tempered with iron to make steel. When hopes and realities align, great things happen. Sometimes, the ugly truth is what is required to harden the steel, create a definitive edge, and purpose an instrument to a great cause. This last one certainly happened to me; my mentor promoted me outside of his very organization with his sharing of the ugly, ugly truth. You know what? I'm better for it, and, it's a testament to his mentorship that he was willing to lose me for my own betterment. So I ask you, have you found someone? 1. Earn your stripes, earn them early. This is relevant to high school, college, graduate school,.. basically anything during and surrounding emerging adulthood. We've all heard that phrase, "Start 'em early!" In many ways, I agree... within reason of course. I tell many people that I mentor as a life coach (of sorts), "Make your claim to fame, and, move on." What I mean by this, is that earlier you start in pursuit of an ideal, the quicker you are likely to achieve it and/or something else truly significant along the way. We've finally emerged into a point in humanity where schooling only means so much. As it stood earlier in the 20th century, schooling actually gave competitive and functional advantages to those who earned degrees. However, the world is now saturated with graduates at all levels. Information is no longer useful; ability is. Therefore, start on something. Pursue with the intent of perfection. It is like what my Brazilian Jiu Jitsu instructor likes to remind me of: The next belt promotion isn't the goal, BLACK BELT is the goal. In life, there are no shortcuts and there are no breaks. The only way to get better in life is to do it; school no longer offers the shortcuts we wished and hoped were still available. The earlier to earn your stripes, the higher up you will be in the areas of life you aim to be. 2. Work hard. Grind harder. Fight even harder. Win. I've said it soooo many times before: As a corollary to "It's not what you know, it's who you know"... I remind those I mentor, "It's not what you do, it's HOW you do it." The only way to get better at something is drilling it, practicing it, perfecting it, and dedicating your life's energy toward it. If you work harder than those around you; if you're at the grind with more effort that those around you; if you put out that much more than those competing against you in the fight... You. Will. Win. Work ethic is the fuel of success. The rest, is made of wise choices, fortuitous circumstances, and catching the ball when it comes. 3. Earn everything, because you deserve nothing. One of the things that truly irks me about an emerging cultural element in our society is entitlement. UGH! Even writing that word out makes me a little ill. This kind of has its own relations to my first thing I wish I knew "Earn your stripes." So often, especially among youngsters, there's this attitude that so long as I do something, I deserve it. NOT THE CASE IN LIFE. What is the case in life is that you must EARN IT. A degree, a certificate, a participation trophy... none of those things makes one deserving of ANYTHING. It is the earning, the achieving, the laboring, and the suffering endured that truly makes someone deserving of anything at all... and even then, they didn't deserve it... they EARNED it. Once you graduate, you've only earned your degree; you must earn everything else. 4. Knowing is second to the ability to apply it. So much of our educational system is based on knowing. So little has to do with applying. I remember this hilarious discussion with a pharmacist years ago when I was learning undergraduate chemistry. Immediately, she rattled off all these useful chemical interactions and how you could do certain things to make one drug into another. When she found out I was learning numbers in chemistry, she just about lost it: "That's not chemistry! That's theory." What I really wish I knew before school was that anything I learned NEEDED applicational platforms otherwise, the knowledge was no more valuable than the words on the page that I gleaned it from. There is far too much emphasis on all the other aspects of life when it comes to schooling. You take a look around, and no matter the level of education (save perhaps graduate business programs), no one ever stresses the importance of networking relationships. When you finally hope to put your schooling to economic use (ie getting a job), no one will care what you know. The truth is, EVERYONE knows what you know because everyone went to school. However, just like I mentioned above: "It's not what you know, it's WHO you know." This old adage reigns true today, perhaps even more so than our recent past. So, I can only stress to you (as I mentioned on my Resume Tips post), make sure you connect with people early on in your learning so that when you need to truly cash in on those connections, they are there for you and willingly so! It's not what you do, its how you do it. That the words "WHO" and "HOW" are but a difference of arrangement. That's all folks. Until Next Time! I've been noticing a lot more talk about salaries and compensation packages on social media as of late. After getting involved in a small conversation myself, it inspired me to write up a blog post on exactly this topic. Note, some of this perspective may be off by just a few years since my days as a rehab director. Nevertheless, the concepts and business constructs remain valid. I hope you enjoy yet another student and career oriented post...!!! 1. Start with a strong point of reference. This may seem almost silly to advise; but, you'd be surprised how many times I was approached (unsolicited, mind you), with someone looking for a job saying "Oh yeah... here I am and I'll work for THIS amount." That amount, being something like 20-25% above my highest paid staff (not to mention even more than that, my own). Doing your own market research on what competitive compensation packages are for your region is the first action of respect when you're approaching the table for negotiations. While you can certainly use websites like Glassdoor (which is actually fairly accurate), asking around for primary sources is the best. Nevertheless, anything is helpful -- just get an idea where the median compensation is per dollar and then extrapolate the totality of possible compensation packages. Check out this Cyber PT guest post for more info, and, this post on related interview tips in the same vein. All this to say, be very mindful about the range your dollar signs can go. Most hiring managers, regardless of their titles, are typically paid only 5% above the average pay grade. There's a lot of red tape, unwanted overtime, and headaches that come with that 5%; RESPECT THAT FACT as you approach the table. 2. Know the business structure. Knowing the business structure is an exercise in deciphering a department and/or firm's supply chain. This is really important to understand because while Tip #1 lets you know a good base of reference for negotiating a number, Tip #2 tells you the actual wiggle room you have while negotiating. While some places can't give you anything above what they initially offer (via company policy), some places just won't. It's not always up to the hiring manager. Therefore, there exists several key factors to consider; the area, the location, and WHY they need to hire. Also, if and when (because you should) tour the facility to which you are a prospective candidate, take a peek and ask around as to what the turnover has been like. This will give you a huge clue as to why they are hiring and what the wiggle room per dollar actually is. A department filled with senior staff; veterans of the department for 10+ years are very expensive to retain. They've received 10 years worths of merits and successive raises; it is likely they will want to hire you to lower their cost per minute. If the department is basically all new staff, what you are likely looking at is a shuffling period for the department or company; there is definitely wiggle room in this case. Also, take a look at what the temp staffing is like. They need to fill a position, that's why you are there; however, they also need to have that position in the supply chain currently manned otherwise they are losing out on precious revenue and botching their customer service. So, take a look at how expensive the local registry (outside agency staffing) is, how much per diem they may be using, and whatever travel staff might be present. These are huge hints as to what they are spending to keep the department floating. The middle point between how high you can ask for versus how much money they are wasting on temp staff represent the wiggle room between what they can offer and what you can ask for. 3. Consider the entire compensation package. Some hiring managers may look at you like you're crazy when you want more money. These managers typically represent organizations that just don't find compensation in cash as the "big" part of pay; they compensate you on benefits. Now, don't take that kind of reaction personally. THEY know that their company gives them amazing benefits. To them, the benefits far outweighs the pay cut in cash. But, you don't know that about their company... not yet, at least. This is where I tell you to fully evaluate any compensation package before you negotiate. This is also where I tell you that typically, unless you have mad connections or hackabilities, it is unlikely you'll have full access to the details of any given compensation package to where you can make counter offers right off the bat. Take the offer home. Ask for a day or two to consider it, nothing more. You don't want to be wasting their time, nor yours. Examine the compensation package carefully. ALWAYS consider the entire compensation package; retirement accounts, pensions, matched contributions, health benefits, PTO, con ed dollars, mentoring, fringe benefits, work-life-balance, opportunity for upward mobility, etc. I've mentioned in the past that some packages take from your direct dollars so they can have some present value of their own to grow the company. In exchange, their contribution matching towards retirement accounts is something truly insane. I've seen companies basically help you accrue upwards of $10k plus a year in retirement funds for the pay cut. So, just make sure you understand the details. If this is your first job out of school, it's no time to be picky. Most of you already know my stance on what to do as a new grad. However, if this is your 2nd job or otherwise, it's time to get a little bit choosy and hustle depending on the situation. 4. Value Added, Cost Alleviated. You're probably thinking, "Alright already! I get it. When do we get to the negotiation part?" Well, any smart negotiation needs to map out all the tools and pathways they have. That is why the first three tips are so important. Without those, you can't possibly utilize Tip #4. They are trying to rip you off, and, you are trying to get more of what you're worth. Sorry, that's the truth of the matter. Where the middle ground is found is when the marginal cost of adding you to the department does not exceed the alleviating any temporary staffing costs and/or lost revenue because of your absence. The more value you add and the more cost you can convince them you'll alleviate, the more wiggle room you have to push the upper bound. Sometimes you can demonstrate how you've already proven your productivity is far greater than par. I've mentioned this in my post about writing resumes. You could also use any formal exposure to whatever additional training to your advantage. 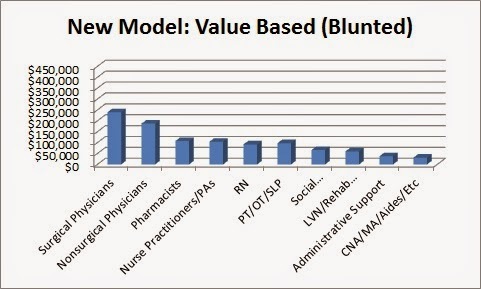 Example: Home health companies are always clawing for PTs already trained in OASIS. Competency in various EHR interfaces is also a welcome plus. Just remember, Value = Benefit / Cost. How much benefit can you bring to this department, company, and/or organization for the cost of compensating you for your time, work, and presence? This is a key element in leveraging and justifying whatever upper bounds you wish to press for. Whenever negotiating, it is crucially important to know who's turn it is. Meaning, who has the control of the conversation. Now while in most situations, it is more common that the employer has the locus of control and they'll pass the control to you once they make their offer. Nevertheless, there are plenty of situations (to which I've been a part of) where the prospective candidate is actually in control! Just make sure when you make your move that it is actually your turn to speak. Now, you're probably wondering when a prospective candidate actually has the upper hand. Well, it happens when the costs of holding a position unfilled has been deemed unsustainable; basically, when the position has been opened for a long time and the market is just really shallow. Trust, me it has happened many times before and will continue to. You just have to have the right timing to strike that iron while it is hot. Asking respectfully with words like: perhaps, consider, possibly, etc... Offer what they want , for what they are willing to give. It can also be managerial support; with operations being ever so tight in healthcare, it could very well be that the manager is struggling to contain the angst of their own department. Support from YOU could be a welcome thing. Caution, this could put you at odds with the staff at large. But, it is a negotiation strategy if you really want something. IN RETURN, you then have some room to ask for things they are willing to give you. Surely, this could be another dollar an hour (maybe even 2 or 3). Make sure you quantify this; every $1/hr is $2000/year. Convince them you are both worth this and why they would want you to benefit from this. Example: If feel this would better reflect the value I can contribute (aka what they want); and, would help financially in my circumstances (as a new grad) to which I can fully dedicate myself to this department and to you (the manager). Good managers know that it can cost upwards of $20k in 2-3 months to fully train a new employee. They do NOT want to waste such resources on turnover. The bad managers... well, you wouldn't want to work under them anyway. What this does is it locks in their need with their willingness to give. You're able to give them what they want. And, they don't want to lose that. Since you asked so respectfully, they like your attitude. Liking you is the most important part of any hiring process. Therefore, since they like you, they will want to find ways to help you. They rather not that you hire in, find all sorts of random other places to work per diem for better dollars, and then eventually get offered a full time position there. So just remember, with the most likeable and respectful approach, offer them what they want for what you've gathered they are willing to give you whether in dollars, in benefits, in scheduling (4x 10s, weekend rotations in/out, whatever), sign on bonuses, extra CEU dollars, etc. Asking with even more respect and grace than you would the first situation (as to demonstrate goodwill)... Offer what they need, for what they are able to give you. Now, I underlined need & able because I've had counter offers from people I genuinely liked; but, the offers were so unrealistic and borderline disrespectful that when I bumped the request up to the powers at be, they got shot down with brutality. So, as stated in Tip #4, most of the time any hiring department wants value added and costs alleviated. Offer them this. Again, many times this is productivity. Other times, its the cost of poor scheduling conflicts due to seniority. Yet, other times, its unwillingness to see certain types of patients for reasons of familiarity, comfortability, competency, whatever it may be. In such a situation, a hiring manager is so pressured to fill both the need of your presence in a position AND the additional value added need being filled, that they are going to do everything they can to convince their own bosses to give you the extra dime and reel you in. I've been there, personally, in such a situation. It's an interesting dynamic and the negotiations can be quite nerve wracking all the way up and down the chain of command. But, the way the hiring manager hustles on your behalf can really make for a wonderful working relationship going forward - it's actually quite touching! IN RETURN, you can now ask for more specific increases in the compensation package that you are desiring. Make sure that you are very clear and REASONABLE about what you're asking for. Avoid insulting the manager and the other staff by asking for a dollar amount far beyond what is actually fair, be it the pay grade or a sign on bonus. Also, be sure that what you ask for is specifically communicated in relation to the need you are willing to offer to fill. Example: If a department is wasting all sorts of dollars for weekend per diem staff, offer to work a relatively robust rotation of the weekend (if they don't already have that in play, or, if their rotations are out of control). In such a case, this is cost containment therefore you can ask for a bit of the cost being contained as part of your pay. You could probably seed in something like: "I'm sure you know that as a new grad, finances can be quite challenging. I like this place. I want to work here and I want to work for you. Could we perhaps, consider a rebuffed weekend rotation for me. For this, perhaps the powers at be would be willing to consider giving me 10 hour days so that I can be more of a work horse on the weekend while increasing my compensation by $X/hr. Just remember that "X" amount must be a reasonable recovery of the marginal value added per marginal cost alleviated. Negotiating your salary is always a game. Sometimes you make it; other times you break it. Sometimes what you ask for is a deal breaker. Other times, it a reluctance. Whatever the case, it is always a gamble. Just remember, the job market is still an element of business. It's JUST business -- it is nothing personal so treat it as such. Therefore, make sure you approach it this way. Surely, be likeable and charming, but also be sure to understand that these days, hiring managers are attracted to humble, thankful, and gracious applicants. Whatever you negotiate, it must benefit them as much as it benefits you. If you can convince them of this, they will surely do whatever they can to make the situation mutually profitable. As part of my efforts in both advocacy and mentorship, I've found that Twitter has been the most effective social media platform. Now, this is an experience in and for myself -- not to say that other outlets such as Facebook, G+, Linked In, etc. are not better or worse. It's simply that I've found that Twitter works for me. And, we tend to favor things we're good at. In any case, I can't advocate enough that both students and young professionals of all walks and of all industries find their way to Twitter that they may benefit as I have. Perhaps the biggest benefit I've experienced via Twitter has been connectivity. A broader reach, a stronger platform, and, a more visible personage has been the wonderful results of how Twitter has changed my life. There are many months that I've seen my organic Twitter circles help me reach easily in the millions of unique connectivities in just 7-10s of any given campaign, initiative, or effort of awareness. When Twitter is used naturally (without gimmicky follow-backs and such), it truly becomes a social connection. And, as such, people learn about you, grow to know you with their trust thusly earned. As such, they are willing to lend a helping hand to deserving causes and intents. Twitter has exponentially elevated my connectivity. The Twitter community is something truly interesting. Everyone goes about it their own way; through lists, following apps, hashtags, etc. Nevertheless, people develop a community based on mutual interest, shared values, common goals, and a passion to make better the lives around us. The Twitter community is strong; perhaps stronger than any other social media platform. It is stronger, as I see it, because there are no privacy settings to hide behind. Twitter is largely public. And, it is an outlet for voices; for ideas. A community of ideas can lead to an outbreak of action; it can, it has, and it will continue to. Twitter has grown the community to which I belong. As if it were such a word... the opportunities to collaborate have been never more accessible than via Twitter. The etiquette of many other methods of communication tend to be more stringent, formal, and closed. It is seen as invasive if unanticipated or uninvited solicitations arrive via email, Facebook messaging, etc. Yet, with Twitter... our words and our ideas are open. Thus, such also is our invitations to more closely connect with each other and work with each other. Twitter has given me more opportunities to collaborate than I've ever experienced before. I've noticed that through my interactions using Twitter, I've found new and expanded purpose... a calling really. It first expressed itself in the realm of exercise and wellness. Then, it came through the promotion of advocacy issues. Finally, it has matured to the realm of student mentorship and business/management consulting. It is easy to have the blinders on too tight; to be too focused on the issues at hand and be blind to all the glorious opportunities available. Twitter allowed me a far broader scope of examination to the areas which I could serve others... the calling to which I could answer. Twitter has the ability to inspire a new calling. I've heard it said before that Twitter is the world's best community college. I tend to agree! The plethora of new views, novel considerations, radical methods of approach, controversial mindsets, conflicting but constructive interactions... all of which, many times, leads to finding mutual solutions. Such is the benefit of continued learning in the context of Twitter. There have been personages, video channels, blogs, and Tweet chats that I've been exposed to and have taken part of that have completely blown my mind. Such opportunities to learn that I can assure you after 2 bouts of graduate school and 1 bout of undergraduate work that such experiences do not occur in formal education. And, as I've heard so many times from others (to which I've seen as well), such learnings through Twitter are often times far more influential. Twitter has opened my eyes to continued learning in ways never seen through formal didactics. And, so! These are but five ways Twitter has changed my life. Perhaps even 2 or 3 years ago, such a post may have been considered fickle, shallow, even self serving. But truly, Twitter is a unique platform of communication, and of, information exchange. There is an elemental rawness, even nakedness of expression, that makes us interact in a way which perhaps is more real.... than is real. Certainly there are those who may be considered "trolls." That's what the block function is for. As to the rest of those many wonderful individuals to whom you can connect, commune, collaborate, find a calling with, and continue to learn from... such are the ways Twitter can change your life. One of the true joys of this blog is the interactions I get to have with you. One of the interactions I love the most is answering your questions. To this, we have Zack Duhamel to thank for today's post. @zduhammy @Jerry_DurhamPT @Sturdy @Cinema_Air @PTDavidG hmmmm. How about a blog? There are perhaps an infinite amount of approaches to how experts feel one should develop any given marketing plan for any given service and/or product. The discussion can be broken down by emerging or incumbent products (to which for the sake of this post, we'll include services), emerging or existing markets, sustaining or disruptive innovations, and-on-and-on it can go. Personally, when I'm thinking through the steps in developing a marketing plan, I tend to want to start with the question "Why?" Why do I need a marketing plan? The purpose is severely important. It is too easy to be blinded as a supplier, "I need plan because I have a product." But, does the consumer need that product, or even, your product? Maybe, and, maybe not. Nevertheless, if one is trying to develop a plan (new or updating the old), it is prudent to at least mentally approach it with a fresh start. And, while a good marketing plan has many feedback loops, for the sake of this blog let's begin with a three part framework in developing a marketing plan from scratch. Does your product fill a need or reduce a cost? If so, you have just created a customer. Then you must answer, does your product kill pains and make gains for the prospective consumer? If so, you have the foundations of your marketing plan. Part 2: What Is Your Marketing Mix? After establishing the fact you do indeed have a market for your product, and, that your product does present a unique value, now we have something to talk about. Your marketing mix. Most marketers consider the marketing mix as the "4 Ps"
Some schools of thought have also included a 5th "P" in the form of Profit. The nice thing about this 3 part framework I'm offering you is that Part 1 *is* your first P, your product. To know that you actually have a product is important! I can't tell you how many times I've seen businesses simply produce something and call it a product when its not really marketable. That's not a product; it's a hobby. In any case, following the 4 Ps, we need to talk about price. Value = Benefit / Price aka "bang per buck." I've also seen equations like: Value = Outcome / Cost. But, really, it's all the same. Value = (Gains made + Pains killed) / Price of product. Right? All the same. It's a matter of perspective. So check your price. Where would it be that you could make your product the most valuable to them? It's not always the lowest price; lowering your price many times lowers the amount of benefit your product can offer as you may not be able to afford high quality products with such low returns -- so think on that. Then, we must think of placement. Many marketers also call this "positioning" to some extent. Where will you be placing your product for sales? Online? Retail? Direct sales? B2B? Will it be sold on the top shelf? Middle? In bulk? How will it be made available for consumers? Will you do a product launch or small market tests? Etc. etc. etc. Finally, you must think of promotions. How will you promote your product? Will you have parallel promotions? Freebies? How will you advertise? Will you engage in guerilla marketing? What's your plan in generating awareness and demand? What about co-branding? Endorsements? Maybe in person sales and demonstrations? All the various ways you have to make your product more interesting and raise share of mind in the general consumers must be considered for this step to be successful. Most importantly, the mental framework of this step must be from the perspective of the consumer. Finally, a blip about profits. Marketers and business strategists (for myself, I identify as a marketing strategist since I generally am involved less in sales and more in the planning, execution, and supply chain side of business)... are regularly guilty of being too theoretical; requiring financiers and accountants to pull them back into reality. Or, making less than happy friction against supply chain and operations managers who have to deal with the day-to-day results of their ivory tower shenanigans. THEREFORE, it is always important to refresh your screen and examine the 4Ps established against the reality: IS YOUR MARKETING MIX PROFITABLE? One of the biggest (and most difficult) responsibilities of any marketer is the screening for future opportunities and threats. Nearly every strategic theorist and marketing guru will hold a different method of approach. Some say go where the demand will be. Others say, go to where the money is. Yet still, another school of thought may be to quell threats and stay ahead of your own strengths. Regardless of how you decide to plot your strategic approach, you MUST include a regular screening of the future market projections. You can use any framework really: SWOT, Porter's 5 Forces, Blue Ocean Strategy... just to name a few. Personally, I'm a big fan of the SWOT analysis because it serves as such a great reality check. And, it also loops back to Part 2 which then bounces back to Part 1. SWOT also allows you to analyze your competition to which then you can attack their weaknesses, follow fast and swoop in on their opportunities, and even split their resources such that they must address their threats, minimizing their ability to attend to current strengths. It's a powerful tool if done correctly, systematically, and with the right gauge of reference points. Perhaps the most important part of Part 3 is the feedback toward Part 2 and Part 1. Just as Part 1 fed-forward to Part 2, Part 2 helps define where you're going with Part 3. But, Part 3 then returns back to Part 1 to answer the question: "Is my plan sustainable?" Will it work out in the long run? If so, push that same thought forward to Part 2 and update your marketing mix. Feed that data into Part 3 again and ensure you're still on course for long term gains. And, of course, continue the loop back to Part 1 to ensure that your product is still marketable - BECAUSE - once it's not, you need to either change your product, change your marketing mix, or change your strategic approach entirely. So you can see, even just the development of a marketing plan is FOUR DIMENSIONAL! The execution, now there's a chess game to be played. And so, this is my three part framework for developing a marketing plan. And, I call it "development" because a good marketing plan is never complete. It needs to be constantly updated, refreshed, and made relevant to the ever changing market environment. Also, it is JUST the beginning as there are sooooo many other frameworks and strategies of approach for success. These are just the first steps in making sure the foundations of any marketing plan you slate out is done so on solid ground. I hope you've enjoyed this episodic Q&A blog. Again, thanks to Zack for bringing up the topic. I hope you all have found it beneficial to your practice, business, organizations, and sense of personal edification. PS. Any and all questions for future blog posts are warmly welcome. Talk soon!